Jim Blaine (jim@weown.it) retired as the CEO of State Employees’ Credit Union, a financial cooperative headquartered in Raleigh, North Carolina. SECU is the second largest Credit Union in the United States, with $38 billion in assets and serving 2+ million members. The Credit Union, with a staff of over 6,000, serves its members on a 7x24x365 basis through 255 branch locations, six call centers, and a 1,200 unit proprietary ATM network (CashPoints) with locations in all 100 North Carolina counties. Jim is a graduate of UNC-Chapel Hill and holds an MBA from Duke University. He is also a CPA (inactive). 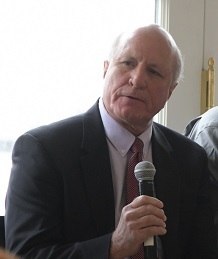 Jim served as CEO of SECU from 1979 to 2016. Jim's past committee service includes the CUNA Renewal Project Committee, CUNA Mutual Advisory Cabinet, and CUNA Roundtable Advisory Committee. He has served on the Thrift Institutions Advisory Council of the Federal Reserve Board in Washington, DC; the National Credit Union Advisory Board of Fannie Mae; the Credit Union Council Board of the National Association of Credit Union Supervisors (NASCUS) in Washington, DC; the Board of First Carolina Corporate Credit Union in Greensboro, NC; the Latino Community Credit Union in Durham, NC; and the Board of the National Cooperative Business Association (NCBA).